I love how so many things happened within a 15 minute episode. There’s progress, even if it’s slow, and there’s still the beautiful cinematography seen from the first episode. Although this episode was a bit slower, it was still full of good stuff – including a confession. (yay!). And it’s official, I’m addicted to this drama. Episode 2 starts off with Ji-hoo waiting at a shoe repair shop to get her heels fixed. The man fixing the heels reassures Ji-hoo that the breaking of the heels can only mean the start of a relationship that will go well. 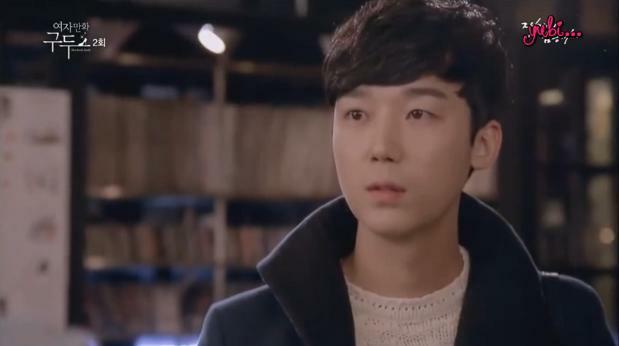 Tae-soo returns from the department store with newly bought clothes and shoes for Ji-hoo. She’s hesitant to accept the bag, but eventually takes it (ofc feeling happy and all fuzzy inside, exactly like how I am reacting right now. Hehehe). She changes in her new outfit so that they can both head to the gathering together. When they arrive at the location the gathering is going to take place, Manager Im immediately notices Ji-hoo’s new outfit. She assumes that they went shopping while working so she demands for an explanation, but transitions her attention to Tae-soo’s nose (which is still red btw). But before Tae-soo can explain himself, some guests arrive so they greet them. The first two are from Hanyang media who is going to promote the shoes from Ji-hoo and Tae-soo’s company. The third person who enters is Choi Yunho (played by Yoon Jong-hoon who you might remember from ‘Monstar’ and ‘Reply 1994’. I love him by the way). When he enters, he immediately notices Ji-hoo and Ji-hoo the same. They stare at each other before the scene transitions into everyone eating. When everyone has settled down, Ji-hoo and Yunho happen to be sitting next to each other. He acknowledges that she’s still the same person she was back in college – Ji-hoo has to drink alcohol and coco-cola together. He then explains to Manager Im and Tae-soo that they both were friends from the same major in college. Yunho expresses his happiness in meeting Ji-hoo again while Ji-hoo can only recall the sweet memories that they created back in college. In those memories, we see Yunho and Ji-hoo back when they were both in college. Yunho is gently blowing on Ji-hoo’s hands to keep them warm. They smile and giggle together and treasuring this moment. We return to the present at the gathering event. Tae-soo notices that Ji-hoo seems to be drunk to which Ji-hoo replies that she needs to go to the restroom. Yunho follows her out by also using the same excuse. Ji-hoo stumbles outside of the restaurant drunk and dizzy and is soon accompanied by a concerned Yunho. At the same time, Tae-soo has come outside of the restaurant to answer a phone call from his Team Manager. He then witnesses Yunho helping Ji-hoo balance herself from falling over. Yunho wishes to take Ji-hoo home, but Ji-hoo isn’t willing to let him. She wonders why now out of all times does he want to take her home, to which Yunho replies by saying that he missed her a lot. She pushes him away, but he tells her that she can’t even walk straight (it’s dangerous for her to be alone). The heavy and uncomfortable situation is interrupted by Tae-soo who approaches Ji-hoo and reacts by tying her loose shoelaces as she and Yunho watch in surprise. Tae-soo saves her from the awkward situation by using the excuse that Team Manager wishes to see them at the office. So with that, he grabs Ji-hoo’s hands and they leave together. 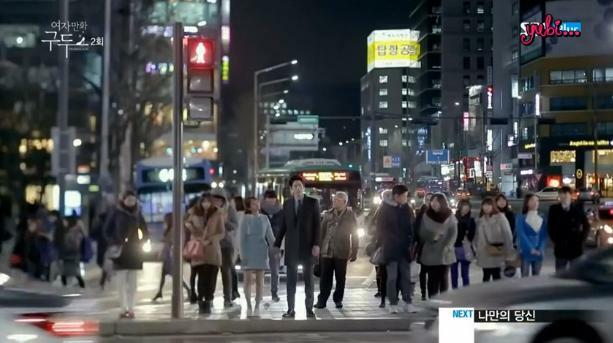 Ji-hoo and Tae-soo are at a stop light, waiting for the light to turn green so they can walk across the street. While waiting, Ji-hoo can only stare at Tae-soo continously because she’s fallen in love with him. 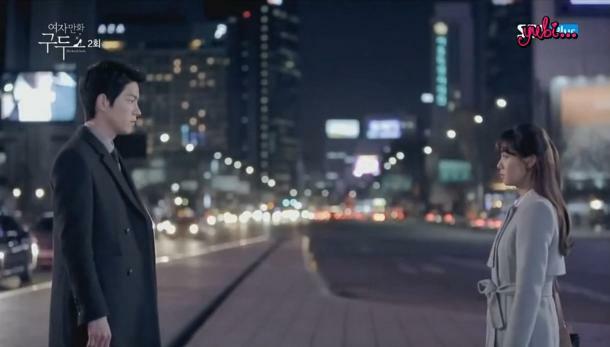 Although the alcohol is getting to Ji-hoo, she does notice how the direction that they’re both walking isn’t the way towards the office though. Soooo where is he taking her? Haha. While walking on the street, Ji-hoo lets go of his hand leaving them to stand across from each other. Maybe it’s because Ji-hoo’s drunk that she has the courage to confess, “I like you.” Tae-soo frowns at her sudden confession so Ji-hoo repeats again, “I like you Manager Oh.” But Ji-hoo is still drunk and feeling dizzy so she knocks out. We see a sleeping Ji-hoo laying on the same bed with a man whose face isn’t shown. She could feel his fingertips brushing her hair softly and gently so she turns around, but doesn’t find anyone there…because it was all just a sweet, sweet dream. That’s when she wakes up to find herself in the house of Oh Tae-soo, the man she has an unrequited love for. I love how Ji-hoo was finally able to confess to Tae-soo when she was drunk. I guess that’s the only good thing that comes out from being drunk right? Haha. Now that she has confessed, all that’s left is for Tae-soo to either reject or accept her feelings. Of course, he’s going to eventually accept Ji-hoo and love her as they are the main couple in this drama, but I wouldn’t be too surprised if he did reject her initially because of confusion and uncertainty with the whole situation. So now that we have the man that Ji-hoo considers as her first love appear in the drama, a love triangle is going to form (which means a lot more cheesy scenes), but there will be conflict and lots of fighting over Ji-hoo so that’s going to be interesting. When watching this drama, I suddenly thought of mobile drama ‘Twenty’s’ (starring my Lee Ki Kwang) that I did a recap of, but stopped because of multiple reasons. This drama is everything that ‘Twenty’s’ should have been. Both dramas are similar in length and directing wise, but it must be the plot that the difference lies for me. Because although both dramas have very common and boring plots, ‘Her Lovely Heels’ actually is not confusing and it’s because there’s no time jumps, skips, flashbacks, unlike ‘Twenty’s’ which consisted of MANY of those which is why I eventually dropped it. If ‘Twenty’s’ had been shown in a consecutive order, I probably would have loved the drama a whole lot more (other than the fact that my Ki Kwang acted in there). ‘Her Lovely Heels’ is straight-forward, direct, easy to follow, and very warm. It makes me feel all giddy and fuzzy inside and I like this feeling. Granted, there are still those cheesy, very cheesy scenes, but I like this kind of cheesy that the drama possesses. 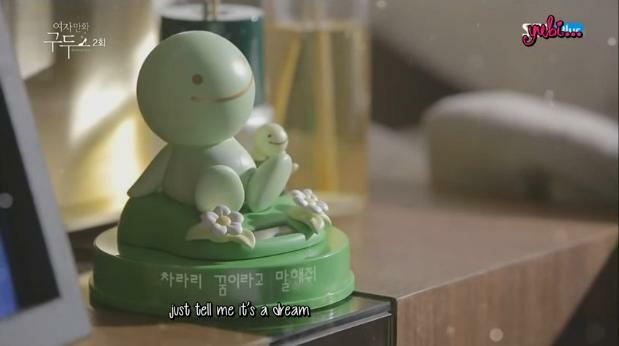 I actually kind of think that’s the thing that makes this drama special and addicting.